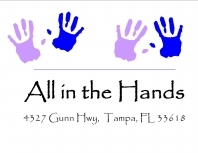 All in the Hands performs primarily medical massage. We specialize in several types of therapeutic massage. We also perform deep tissue, massage for fibromyalgia, stroke recovery massage, pregnancy massage, sports massage, and massage for the terminally ill. Please call for more information 813-393-8341.